Yes...this is the strange place. The one about my life. I hope that you all have not forgotten me! I'm sorry for being quiet for months. I just haven't been feeling very blogger-ish for a while and had no inspiration. Also, since secondary school started, it takes up most of my day. 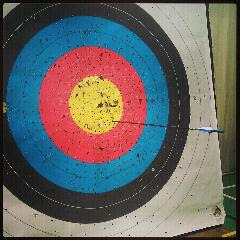 When I'm not doing homework, I'm practicing archery and it takes up the rest of the day and by then I'm too tired to write any blog posts. The same thing happened with my FanFiction stories...I've abandoned my characters for a long, long time and I think they've all been feeling so lonely, as I'm sure you guys were too! This is just a random quick update to show you guys I'm still here! So how are your Christmases going? What presents did you all get? I guess I don't have much else to say. Get a very simple, small whiteboard that you can stick on your wall or somewhere around the house. This does not have to be any bigger than an A4 page. Also, grab some whiteboard markers in a few colours, preferably 5 or 6. Divide your whiteboard into 3 columns, making the middle sections much larger than the other two at the side. Now, draw horizontal lines, dividing the columns into boxes. Make sure there are enough boxes to fit ALL of your subjects. For example, I have 10 subjects that give homework, so I have ten rows, three boxes across each. Leave a space st the very bottom of the board, this will be used for colour coding. Label the boxes on the left hand side with your subjects. Example: English, Maths, History, e.t.c..
On the right hand side, take note of the names of books you have for each subject. This should afterwards be used to fill in the books that you need for that subject's homework. Red = it's due tomorrow. Pink = I have two day to do it. Green = Three days to do it. Blue = Four days to do it. Black = 2 weeks+ . When you get set homework, write it down in the middle section of the board, using the correct colour of marker. For Example: If my Maths homework was due tomorrow, I would put the homework down in the middle section with a RED marker. This can help prioritize your work. Mark down ALL of the work you have, including learning work, which is very important. Rub it off as you finish it, and so lightening your load! If you don't have a whiteboard, you can always use a small piece of paper, but make sure that you don't lose it. Keep it somewhere safe so that you can keep coming back to it and marking off the work. My friend told me that she could not post any comments on my posts since I changed the look on my blog. We sent each other screenshots of my blog, and sure enough, her 'Add a Comment' button is missing! She also said that the whole sidebar of my blog where my 'Blog Archive' and the 'Tag Cloud' and everything like that is gone too. I was wondering if any of you were having the same problem? It's awful to think that my readers can't post comments. Maeve said that it might only be her computer, but now that I'm worried, I just need to check! Hello again everyone! :) I wasn't expecting another post this soon either, but here it is for you to enjoy! Dress up! Or don't, depending if you want to look like a hobbit, or if you want to look like a hobbit with no shoes. Have a Movie Marathon! This is a popular choice, because the very scene of Bilbo's and Frodo's birthday is portrayed in The Fellowship of the Ring. All you have to do is watch all the movie that came out so far (both LotR AND The Hobbit), and cry because Desolation of Smaug isn't out yet. This should be enough to get you all started! :) How are you all going to celebrate? Any more ideas? I don't think I'm going to do anything exotic, maybe walk around barefoot and in a hobbit-like dress - that's probably it. (This was written the Saturday after Tuesday the 27th of August :) ) Well, hey there everyone! Great to see you all again so soon. I was meant to write something on Tuesday, but then I just felt so tired, and I needed to take a rest. Because of the very topic about which I'm writing today! Tuesday was a really big day for me. It was like a milestone in my life, because I (finally) seemed to grow up! I started secondary school. Anyway, we were in for about two hours. It was great fun! First of all, we were sorted into two classes, 1 Ash and 1 Oak. Trees? Well, they said they picked them because they were both beautiful trees and because they grow and just like our lives and ourselves through secondary school. Something like that, I forget the exact words. Secretly though, I think they picked it because they could be wood elves. That would be awesome! Did you hear that everyone? I'm officially a tree. We got these timetables, which were the most confusing part of our day. For example, everyone picked different subjects for....the ones you had to pick...and now no-one knows which subjects are on that time in the day, so you could come into Art all set for Business Studies, and walk into Business Studies with your cookbook or something. That's how crazy it is! Hopefully I didn't just confuse you all with that part, because to be honest, I'm pretty confused myself. Yes, well the next part was making friends! I made three new friends almost straight away. Gabriele, Zara,Claire and Zoe were really nice to me, and I saw both Claire and Gabriele in the uniform shop in the summer. Now we are in the same class, so I'm really happy! Sorry guys that this was so late...school's been keeping me busy, and so had everything else apart from it. I will start blogging a bit more when I can, but now that school has fully started, don't expect my posts to come very often, and they probably won't be as big as usual too! So...imagine you are in Middle-Earth, or more specifically, Mirkwood. Here are ten things that I would do while I'm there. 2. Check if Legolas' hair is a wig. If not, check again. If yes...pretend you're him (hair and all included)! 3. Walk on the Forest Path, following in the footsteps of Thorin and Co.
4. Discover chocolate, and bake chocolate-flavoured lembas bread! 5. Have a portrait made of me beside the Orc chief, just to prove I survived. 6. Hide Legolas' bow and observe the consequences. 7. Pretend you're a cat, glue fake claws to your nails and imagine that Thranduil's belt buckle is a sparkly bug. Run. 8. All aboard the party elk! 9. Have a conversation with a Giant Spider. 10. Introduce the elves to modern-day music. Cover your ears. 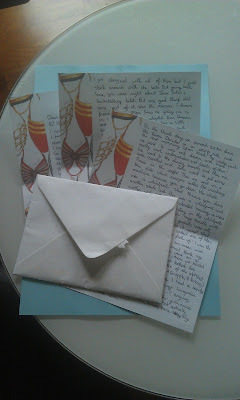 I'm back with the second part of Responding to Letters #1. As usual, I will omit some parts of the original letter so the sender's privacy will not be disclosed. The quotes that I do take, however, are not altered in any way, apart from some spelling corrections. Please enjoy this part, and let me know what you think of it! My inserts are in bold font. Date received: Monday, 12th of August, 2013. Last Revision Date: Wednesday, 14th of August, 2013. "We went on a scavenger hunt one day, where we rented bikes, cycled to town and looked for something with every letter of the alphabet and took a picture of it - A for apple, B for bag." Oh, I love scavenger hunts! In my school, we had a Friendship Day scavenger hunts where the teachers got us to search for letters hidden around the school and school yard, and then unscramble the letters to make a word. Even though we knew that the letters always spelled "friendship", it was good fun to look for them with a partner. "When we went horse riding I had a sandy coloured horse with a strange Hungarian name. I think it was Chua...?" I'd love to go on a horse named Chua. That name reminds me of Chewits, and they used to be my favourite sweet until I came across this lovely Russian chocolate sweet, or which I forget the name. It was covered in chocoalte and had a delicious nut on the inside. "I was in a room with six other girls, because there were only seven of us that actually went. I got along well with all of them, but I just stuck around with the lads. But going back home, you were right about Jess." Really? Hm, that's news! For those of you that don't know Jess was a girl I just didn't like much. I won't go into details because that would take far too log, and probably not very interesting anyway. "But one good thing did come out of it, she's the reason I became friends with Olga. She was adopted from Russia, and she's really sweet." Aw, I'm from Russia! I moved to Ireland with my parents when I was about seven and lived here ever since. Sometimes I miss Russia, but mostly I have far too much fun here to want to move back! "She has a grey and white cat named Wispa. He's a vicious little thing. but he's alright when you get to know him. "Having five cats myself, I know what it feels like having one little arrogant cat. Gammi has the most annoying meow which sounds something like this: "MMMMMneeeeaaaaowwwrrr!" Hopefully I didn't just burst your eardrums while you imagined what must have sounded like. Let me tell you, horrible. Well, I think I will leave it at that for now, I think it's getting a bit long. I will respond to the rest of this letter in the next post, Responding to Letters: #1 2/2. Ow! My feet are very sore, due to a day (last Wednesday, to be precise) spent by walking along a cliff, on a very scenic route. The Greystones cliff walk is a gorgeous trek across the edge of the Irish sea, and takes only about four hours, from Greystones to Bray, about 6-8 kilometers away. The wildlife is plenty there, and some very remarkable spots are hidden in the lush green hills, behind the edge of the cliff, and even on the path. Because it was a warm day, there were many people there, including - I was very surprised at this - my school secretary. It was quite weird, to stop and talk to a person I knew only barely, and that I rarely saw in school anyway, and know that they remembered you still as the person who came third in the Eason Spelling Bee in Dublin, and the girl that painted 'The Sunflowers' in fourth class. Wow. Anyway, after what felt like a long time, we stopped and sat down for a small snack. My mum and granny brought sandwiches, tomatoes, cucumbers and variations of ham, and even some juice to go with it. We carried it all the way to the spot! One of the places I remember most clearly is the old railway crash place. I'm really sorry that I can't remember the proper name of the place, but there's really only one place there like that, I think. Anyway, a lot of years ago, the railway tracks crossed a bridge there, but the bridge collapsed when the train was passing by on it. The tracks were averted from the place from then on, but you can still see the remnants of the old bridge, crumbling away into the sea, and I got some lovely photos of it. I also got some great photographs of the sea, the cliffs, the sea, more of the sea, and some butterflies and flowers...but mostly the sea. I saw a boat on the horizon. A nice day at the zoo is great - and we went to no other than Phoenix Park. It was fabulous! There were awesome animals there. We saw awesome tigers, cool seals, shy snow leopards, puppy-like grey wolves, a flamboyance of flamingos, gorgeous red pandas and many other animals besides. It was a fabulous day to spend with my mum, granny and best friend, Maeve. To get to the zoo, we went by tour bus - we wanted to show my Granny the city, and take a trip to Phoenix Park. Luckily it didn't rain (like today) and it was quite warm, so we really enjoyed the day out. We also got ice-cream there and it was lovely (all of my scoops had some variations of chocolate and since Maeve doesn't like chocolate ice-cream, we were opposites.) I got mint chocolate, triple chocolate, and vanilla chocolate cookie ice-cream. Total choc-a-holic. All in all, it was a great day out and what made it all the more sweeter was the fact that we had a sleepover straight after! Maeve and I had a fabulous time, laughing, writing stories and watching TV and doing other hilarious stuff. I took a few photos at the zoo too, and my mum took some photos of us on the tour bus, our hair flying out behind us because it was going so fast! Great. It's lashing rain outside again, and it hasn't even been too long! I think Ireland is a magnet for bad weather, because rain storms come far too suddenly. I mean, really, it was a normal, cloudy day and then - yay. Rain. Archery was on on Saturday again, and this time it was getting harder. Did you know that I'm officially known as "Goldfish" in that club? This is because I have the memory of a goldfish. Around three seconds. I mean, it's sore when you hit your arm with the bowstring - repeatedly! They wrote down steps for me to do while shooting, and I left the sheet at home. It seems as though I have improved though, and got four custards (we named the colours on the board after food - I don't think any of us had lunch) from 18 metres. I think I will show you the one in the actuall centre - the ten - and the dodgy arrow. It was actually me that (sort of) broke that arrow. I'm not fully sure what happened, all I know is that the arrow somehow snapped back at me when I was firing it - I was not hurt, don't worry! - and then something went awry. It's a worldwide mystery, what happened that day, but I managed to get a ten with that arrow anyway. At 18 metres. I'm proud! Architecture can be really weird, or just plainly illogical. How can you possibly put a bench five metres away from the table and not notice? I don't think it was really supposed to be so inconvenient. Or else someone was having a really good laugh. At their expense. Well, it's coming up to my birthday soon and I'm really excited! This year I'm having a party in Xtreme Adventure Centre and I invited 5 people from my (former) class. I'm only quite sad about the fact that one of my best friends is going on holidays. Ok, scratch that. She's already there! There are going to be so many different and amazing things there that we are going to do; even the forty-minute-long drive there is very well worth it! Archery, aerial trekking, climbing, abseiling, zip lining and the giant swing - there's a lot to do, and it will last about four hours. We need to bring a lot of water for that! And you know...this means I will do archery all weekends. Both Saturday and Sunday. Which also means I am going to very tired but very happy at the end of the day! How do you celebrate your birthday? Do you have any special family traditions to make the coming of a person into this world? I also like the Chinese zodiac signs. They are all animals, and - as you may have noticed - I love nature. I know half of my posts are about nature walks, but all the flora and fauna is all around you, so why ever not? Another thing I found interesting is that I am born in the year of the dragon. Dragon. Smaug, anybody? I told you already that I really enjoy walks in the park - now I will tell you again! This time, my family and I went to Tymon Park for the evening. It was still sunny and bright outside, summer's work, so we wandered around there for an hour or so. I saw some more rabbits when we were passing through a field. I got really close and even filmed a video, but obviously nature doesn't like paparazzi. The rabbits were right beside a giant bush, and that with the sun on the other side equals lots of shadows. Isn't it typical that the rabbits have to be dark too? Looking back on it, I see how ironic everything really is, but that didn't stop me from loving my walk! On our return journey, we introduced ourselves to a family of resident swans in the lake. The dad came right out of the water and doubtless tried to shake our hands - mine in particular, for unknown reasons - on numerous occasions, but he didn't quite reach. I have no idea why I feel so relieved! Did you know that they must have liked the look of me so much that even the small cygnet hissed me a hello? Hello again everyone! I am back! I just wanted to say, I created a blog with my friend Maeve Kelehan. It's called Amazing Animals, and, you guessed it, it's about animals! We are just going to write about animals and stuff. You know, all different types of unusual and amazing animals that we come across. Also, we are going to have Pages of Honour for two of our favourite animals, a sloth for Maeve and I chose armadillos. Just because they are so cute when they are little baby armadillos! Anyway....we are just going to be blogging every day, taking turns. Maeve one day, I'm the next. By far, we just have my introduction up. Enjoy the show then, and don't throw the popcorn at the monkeys! Feeling sick is not one of my favourite pastimes. Anyway, I find it strange but really cool that they can purr for only a moment on your lap, but you start feeling better almost immediately. It's a wonderful gift. Here's Echo on my lap! Woah, I just came back and I see a blank page where this post was, and my cat (Kisik, or Lurkeeo) lying (seemingly) innocently beside my laptop. I, of course, wail in despair until I realise that it is actually about 453 spaces in the document...I didn't count, these are approximate figures. Hah. Also, I might sound crazy, referring to my cats as if they can understand me, but you never know. Maybe they secretly plan on taking over my house and occupying all of the computers and sofas so they could read my posts - oh, I think I'm really gone cuckoo now. Never mind. My five cats are the remedy...if they aren't the cause! I like unexplained questions concerning acorns and elfing around to try to explain them. Elvish Kitty's blog. Awesome Inc. theme. Theme images by loops7. Powered by Blogger.